We didn’t think we’d see Thunder-Warriors, but who’s complaining? All season long, the Golden State Warriors and San Antonio Spurs seemed to be on an irreversible collision course. Both were historically dominant, and it seemed a practical certainty that they would eventually meet in a Western Conference finals for the ages. The Warriors did their part, beating the Portland Trail Blazers in five despite missing Steph Curry for the better part of the series. But the Oklahoma City Thunder shocked the Spurs, knocking San Antonio out of the playoffs with a 113-99 victory Thursday night. After all the buildup and all the hypotheticals, there will be no epic Warriors-Spurs showdown. And given the Spurs’ preseason hype — as well as the extraordinarily high level at which they operated all season long — San Antonio’s second-round ouster has to be seen as an historic disappointment. But NBA fans can take solace: The Thunder ought to give the Warriors a terrific series, too. So San Antonio only gets a playoff score of 125 points for all its trouble this season — an absurdly low total for a team with its +11.3 efficiency differential. 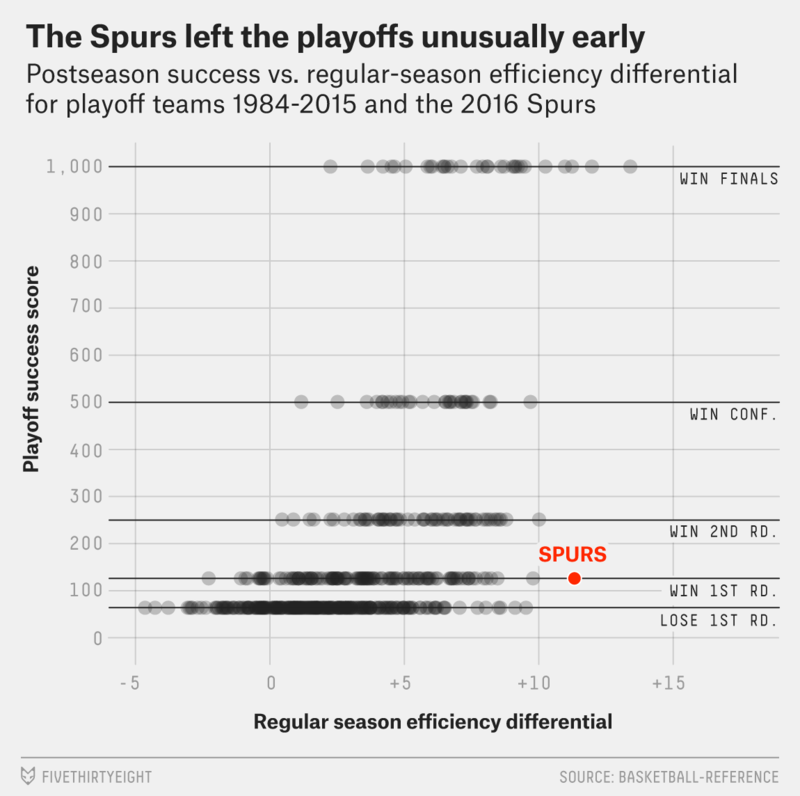 Excluding the 2015-16 Spurs, teams with an efficiency margin of +10 or better since 1983-84 averaged a playoff score of 859.6, which is somewhere between a championship victory and a Finals loss. The previous low playoff score for a +10 team was 250, achieved by the 2008-09 Cleveland Cavaliers, but even they managed to make the conference finals. San Antonio didn’t even get that far. Since NBA adopted current playoff structure in 1984. Not every series that looks great on paper ends up delivering on its promise. But with Kevin Durant and Russell Westbrook facing a healthy Steph Curry and the rest of the record-setting Dubs, nobody outside Texas should complain about the Spurs’ early absence from the playoffs.